You thought there was hope in the world. You thought, no matter how dim and ominous things looked, you could remember 2017 as the year the pure, six-speed manual of a Honda Civic Type R came to the U.S.—to be controlled only by a human who loves three pedals. But, alas, the Type R has gone autonomous. Good thing it’s only a lawn mower, right? Autonomous mowers don’t sound too bad, really. Honda made this autonomous Type R lawn mower to celebrate the Type R badge’s 25th anniversary, using its Miimo brand that sells robotic mowers for about $3,000. The company did the same for the Fireblade motorcycle, which is also on its 25th year. The company said the hardest part about making the Type R lawn mower was figuring out the spoiler—since you need all the downforce you can get while cutting grass—that required a “malleable and waterproof material” that could be shaped when heated and cooled. Carbon-fiber vinyl got slapped onto the spoiler once the shaping was done, because you’re not cool unless all of your earthly possessions have a touch of carbon fiber. But not even the richest of kids—or adults, rather—can buy these, yet. They’re not on sale as of now, probably because the company got sick of molding that spoiler so precisely only to have customers use it as a handle to carry the thing around. (Hopefully not after having a run-in with animal poop, like some of those robotic house appliances are known to do). That makes them about as easy to get ahold of as the actual car! 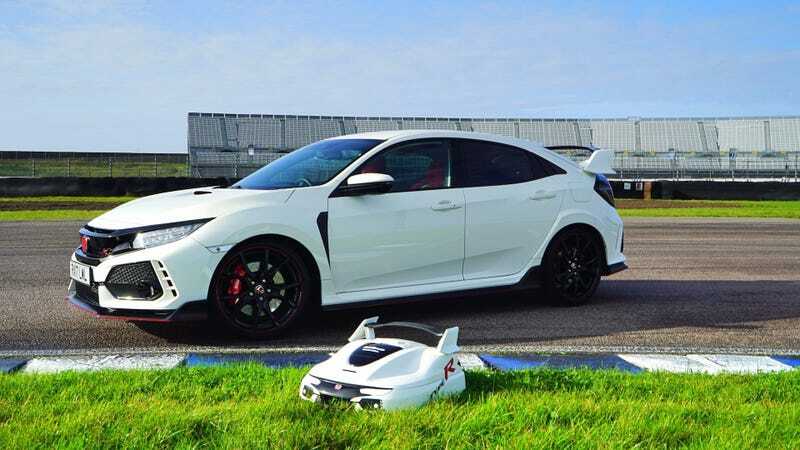 And no, Jalopnik has not reached out to Honda asking if the Type R lawn mower will have VTEC, because that would be weird and the people there would judge us. Nice thought, though. It probably would have made for a funny email.